What exactly is the draw of “The Romanoffs,” Amazon's new anthology series about supposed modern-day descendants of the Russian royal family? At a purported price tag of $50 million for eight episodes, each of which runs close to 90 minutes, you would imagine it was something pretty compelling—some genre conceit (the Romanoffs are shape-changing aliens! ), sweeping historical narrative (they’re coming back for the crown!) or other element on the scale of epic (every episode is also a musical!). 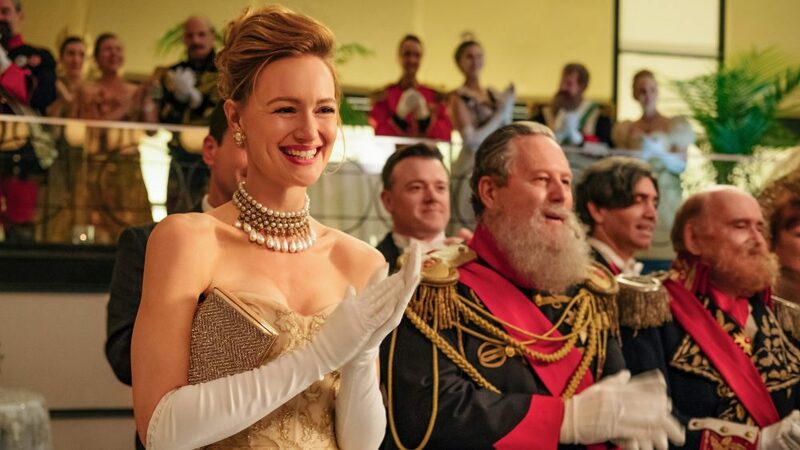 But having watched the first two episodes, it seems this show’s sole sellable point is the fact that it was created by Matthew Weiner, heralded creator of “Mad Men.” Much like the stories of the exiled progeny of the Russian royal family themselves, “The Romanoffs” offers winding shaggy-dog tales that you keep assuming will eventually offer some sort of brilliant a-ha moment or punch line that draws the meandering narrative threads together and dazzles you with its revelation. It's Matt Weiner, that's what he does, you tell yourself. But no, this time the joke is on us. And even as I write this, with no little astonishment that so many smart TV executives thought audiences today that have so many options and so little patience would be willing to sit through an anthology of eight movie-length episodes that have no connective tissue other than the name of the creator, I can't help but wonder: am I actually reacting to a poorly conceived show or to the fact that its creator was accused of (and hasn't really denied) sexually harassing one of his “Mad Men” writers, and was described by another woman on the show, “Dietland” showrunner Marti Noxon, as an “emotional terrorist”? Did I dislike the second episode because it told a story we have seen a hundred times before, of the restless man who has the affair and is then surprised to discover the woman isn’t interested in something long term? Because it insisted on taking 90 minutes to tell it? Or is it because the main character, played by Corey Stoll, bears more than a passing resemblance to Weiner? Do I dislike the character of the wife in that episode because it gives the great Kerry Bishé of “Halt & Catch Fire” so little to do? I swear there are moments you can see her wondering what exactly she has gotten herself into here. Or because her character, a smart accountant trying to make her marriage work, in the end dismisses her instincts to dump her distant, passive husband while he cheats on her with a hot dancer. Isn’t that exactly the kind of story you expect from a guy who has little respect for women? Whether you think an artist should be able to move on and tell their stories regardless of whether they performed lewd acts in front of female comedians, as Louis C. K.’s pals have been arguing, or you believe the art somehow stands separate from the person, as many of us have said at various times about Roman Polanski or Woody Allen, the fact is I can’t help but think of Weiner and his relationship with women as I’m watching “The Romanoffs.” And even if it offered a compelling story, rather than a long, cynical version of “Love Actually”—the overarching theme of the first two episodes seems to be that people are fundamentally vain and stupid (except you, Kerry Bishé, never you)—the damage posed by that distraction is undeniable. We may live in an age where even first-year television showrunners can be considered auteurs, interviewed with the combination of intensity and adoration previously reserved for the greatest of filmmakers, but like all good magic shows, television only works if the audience is fully caught up in the moment. Watching a magician saw his young female assistant in half is a far different experience when you go into it knowing the magician may have a history of attacking women just like her. Stepping back from the accusations, the fact is, while “Mad Men” was a Matthew Weiner show, it succeeded because we were caught up in the stories of Don and Peggy and Joan and Sally and Pete and Roger. We came to love Weiner because of what his team did with those characters, not vice versa. With “The Romanoffs,” Amazon seems to have bet the reverse could also be true. So far the result is an act of self-indulgence worthy of those who insist they are Romanoffs, but not one worthy of our attention. Hi Jim -- I was mesmerized by the 1st of the Romanoffs episodes, literally on the edge of my seat, which is not all that comfortable at my age. I had no expectations because of the Weiner connection because I had never heard of him and didn't watch Madmen. You, on the other hand seem to have a hate on for Mr. Weiner and it colors the entire review. Why not take each episode on its own merits and not worry about Mr. Weiner or aha moments. They are stories built around a common bloodline. Episode 2 was a little disappointing, but I have high hopes. This is not a true review of the Romanoffs. The author is using the "review" of the show show good or bad as a platform to attack Weiner. Jim McDermott, S.J., is America’s Los Angeles correspondent and a contributing writer for the magazine.